Roger Lowenstein, Penguin Books, New York, NY. 2015. Despite the fact that America’s Bank, the story of the founding of the Federal Reserve system, was released in 2015, it is just as relevant today. The nation is facing a looming financial meltdown yet again, and at the same time we are unable to generate the credit necessary to rebuild our collapsing infrastructure and industry. Although lionized by Lowenstein as “America’s Bank,” the Federal Reserve has actually played a central role in perpetrating the nation’s major financial and economic crises. Ironically, these two areas—ensuring economic development and jobs; and financial stability—-constitute its dual mandate. The response of the Federal Reserve to the 2008 financial meltdown was to bail out the very financial institutions which caused the disaster, the Too-Big-to-Fail Wall Street banks. The Fed did this to the tune of over $16 trillion in long term, virtually zero-interest loans. Under rubrics such as “Operation Twist” and “Quantitative Easing,” the Fed lowered interest rates to zero and pumped trillions of dollars of new money into the same banks, corporations, and shadow banking entities. The result has been the generation of a new, even larger “Everything Bubble,” which is heading toward collapse. At the same time, the Fed has refused to pump credit into the real, productive economy, “Main Street.” The result has been crumbling infrastructure and a skeletal industrial capability. If the Fed is not America’s Bank, then whose is it? Ironically, Lowenstein goes a long way toward stating the truth: that the Fed was the product of foreign intervention into the United States from Europe, especially Great Britain. But, by dismissing out of hand the role of prominent American statesmen Alexander Hamilton, John Quincy Adams, and Abraham Lincoln in creating a uniquely American National Bank policy, he conveniently sweeps under the rug the solution to the dilemma that confronts us now. The truth is that the Federal Reserve was foisted on the nation by a network of powerful bankers centered mainly in Wall Street and secondarily in Chicago, working as direct conduits of European central bank moguls. Lowenthal correctly identifies Kuhn Loeb banker Paul Warburg as the key channel through which these Central Bank models entered the country. But Warburg hardly acted alone. His primary accomplices were to be found in the banking circle of JP Morgan and his allies. Morgan Bank was an American outpost of the City of London, the Bank of England, and the British banking establishment. This transatlantic spider web has constituted the mortal enemy of the United States from the American Revolution onward. On and off through the 19th Century, the United States had its own national bank, including the First Bank of the United States, the Second Bank of the United States, and later the Lincoln National Banking system. The original Bank of the United States was created by Alexander Hamilton and served as the model for similar such banks in the United States and around the world. Under this policy, the United States forged ahead, creating the most powerful industrial economy in the world by the end of the 19th Century. But that policy had begun to be taken down following the Abraham Lincoln presidency. As the financial system became more deregulated, this spawned regular bank panics from 1877 forward. They culminated in the catastrophic Panic of 1907 (not unlike the 2008 meltdown), which caused a major depression. It exposed the bankruptcy of the U.S. financial system. As we shall show, the 1907 last catastrophe led directly to the importation of European central banking, a system which had been vociferously opposed by Hamilton and his circle. This report will elucidate that process in the hopes of better informing the reader of just what kind of predatory animal the Fed really is. In 1791, Congress created the First Bank of the United States (BUS) to organize the nation’s finances and generate credit to the real economy. Despite the spurious charge by Lowenstein and others like him, the Bank was not modeled on the Bank of England, whose purpose was to finance the endless wars of the British Oligarchy. The BUS’s purpose was to provide a stable currency and make available cheap credit to pay for infrastructure projects, industry, and commercial activity of all kinds. The Second Bank, created in the wake of near-defeat in the War of 1812, was much larger and functioned along similar lines. It helped finance the new canal and railway infrastructure system of the emerging nation. Lincoln restored Hamiltonian national banking in the Banking Acts of 1863 and 1864. Because this was done under wartime conditions, the structures were different. All national banks were compelled to join the national bank system, and purchase bonds from the Treasury as security against loans. The new national banks were allocated issues of Greenbacks against their Treasury bonds held by the government. The Greenbacks were then used as credit to finance both the war economy and the nation’s infrastructure. Apart from the total defeat of the Confederacy, the result was the erection of the most powerful industrial economy in the world, which became a model for nations around the globe. This policy came to an end with the Specie Resumption Act of 1875, an austerity measure, which began the removal of Greenbacks from circulation, curtailing the industrial expansion. The American System, as developed under Hamilton, promotes the expansion of industry, infrastructure, and a growing standard of living for all, the General Welfare. It is driven by scientific and technological progress, the result of fostering the creativity and productivity of the population. The American System championed a protective tariff, internal improvements, and a national bank. The mortal enemy of the American System was the system of the British Empire and its European allies. The British System protected Imperial industrial and economic progress inside the empire (Imperial Preference), but exported free trade and brutal colonialism outside. The Empire pillaged their colonies and adversaries alike. Among their chief weapons were the various central banks. These central banks, like the Bank of England, the Reichsbank, the Bank of France, and others, were strictly private(!) and were created to provide credit to the government and collaborators of the empires. They underwrote the imperial wars of expansion and served as lenders of last resort to their banking friends. Central banks bailed out financial systems when the excesses of the bankers brought upon ruination. This is the background against which the origin of the Federal Reserve must be understood. The assassination of Lincoln and the take-down of national banking policy left in its wake triggered several processes. The national banks, now operating under the straitjacket of Specie Resumption austerity, had to keep a reserve equal to 25% of their deposits. Country banks, not in that system, had to keep 15% in reserve. National banks were barred from opening savings departments and extending credit for mortgages, and were prohibited from domestic or foreign branch banking. National banks could not lend more than 10% of their capital to one borrower, and ceded the playing field to state banks. The big Wall Street banks– Morgan, National City, and others–chafed under the restrictions and began to evade them with interlocking directorates and other monopolistic expansion. Thus emerged the Money Trust, which would later be exposed in the Pujo Committee hearings of 1912-1913. JP Morgan in 1910, waving his cane in anger. Since they were not as constrained as the New York mega-banks, the power of the state banks grew rapidly. The dollar value of the business at the Chicago Clearing House increased 410% from 1866 to 1885. After the passage of amendments to the National Banking Act in 1887, which allowed the creation of new central reserve cities, St. Louis and Chicago immediately qualified. Meanwhile, the dollar value of bank clearings, which was the mechanism under which business and check clearings was conducted, radically shifted to cities outside New York, increasing from 24% of the national total in 1882, to 43% in 1913. The New York share of banking resources fell to 18% by 1912. The New York banks determined to act. Taking advantage of the fact that the United States had emerged as the world’s pre-eminent industrial power by the turn of the century, the Wall Street bankers allied with the newly minted robber barons. Out of this unholy marriage came the infamous Money Trust. It was executed through interlocking family and corporate directorates and alliances, as documented by the muckrakers and other writers of the period. Exemplary was the Stillman-Rockefeller group. James Stillman was president of National City Bank, forerunner of today’s Citigroup. In the 1890s, he collaborated with John D. Rockefeller, E.H. Harriman, and Jacob Schiff (Kuhn, Loeb and company) to take over and control the Union Pacific Railroad. By the 1890s an overlapping syndicate, the Morgan group, had accumulated more money and gold than the U.S. Treasury Department! It controlled 70% of the steel industry and 20% of all corporations. The Morgan group had interlocking directorships with First National Bank, National City Bank, Hanover Bank, Chase Bank, and numerous large insurance companies. To provide favorable publicity, they bankrolled and largely controlled the New York Times! The inner working of the Money Trust, went as follows: the investment banks (National City, First National, Morgan, Kuhn, Loeb et al.) created securities, then sold them to the insurance companies (which they owned or controlled), who in turn sold them to European investors, who were the biggest purchasers of U.S. stocks! From 1880 to 1895, European investors spent $2.4 billion in the U.S. much of it on railroads. By 1914, they owned $4.5 billion in government and non-government bonds, most of which was engineered by JP Morgan. Yet the NY bankers were still losing control of the national financial system to state and local banks. They were determined to recapture their hegemony. This process occurred against the backdrop of a financial system which still had the remaining constraints of Lincoln’s National Banking Acts, which put a damper on even greater criminality, and thus the Wall Street cabal schemed to end. Additionally, for both Wall Street and the nation, there was the absence of a central credit institution, no lender of last resort. The financial system was rocked by continual and escalating panics and collapses from 1877 to 1907, and it was only the personal intervention of JP Morgan that halted each collapse. The Panic in 1893 led to an economic depression which lasted into 1897. This crisis was bailed out by Morgan. but it also spawned the creation of the Indianapolis Monetary Convention, which established the Indianapolis Monetary Commission to attempt to address the underlying causes. The commission was run by J. Laurence Laughlin, chair of the newly founded Economics Department at the University of Chicago, and his assistant H. Parker Willis. The commission’s report, written by Laughlin, was turned into legislation and introduced into Congress, where it languished in committee. Notably, the report called for allowing national banking associations created and run by the banks to circulate notes on commercial assets (as opposed to U.S. Treasury notes). The notes would be issued by the Office of the Comptroller of the Currency, backed by the capital of the associations. The associations could also open branches, a first step for the banks. The Panic of 1901 was the first stock market crash in the nation’s history. It was precipitated by the “clash of the titans” Harriman, Schiff, and James Hill. The nominal issue was ownership of the Northern Pacific Railway. Ultimately a compromise was reached, but in the process, thousands of investors were bankrupted. Depositors lined up during the panic of 1907. The final and crucial event that precipitated the founding of the Fed, was the Panic and collapse of 1907. As a result of decades of lax regulations, financial bubbles proliferated in the system, in both Europe and the United States. The panic began in Europe but spread quickly into the United States. The collapse of United Copper Company, due to wild speculation, led to the near disintegration of three Wall Street banks. It soon sparked a run on the Knickerbocker Trust Company. Other trust companies began tottering and the crisis became too great for Morgan and his allies to stop. Trust Companies then were like the shadow banks of today. Their operations fell outside the purview of the Treasury Department, as strictly speaking they were not National Banks. They began as quiet repositories for the wealthy to park their estates and family trust funds. As they grew larger, they began speculating on risky assets, especially real estate. They created the “off balance sheet liabilities” of their day. The national banks then skirted the rules of the U.S. Treasury and began directing their clients to invest in those institutions. The trusts thus created the “special purpose vehicles” to reap high returns on questionable investments. After the initial series of shocks in 1907, JP Morgan assembled a top group of Wall Street financiers, including James Stillman of National City and George Baker of First National, and they rounded up enough money to temporarily save Knickerbocker. But when the panic restarted and began spreading nationwide, Morgan and company needed the Federal government’s help. They did not have the capital necessary to stop the torrent of crises gripping the country. Morgan turned to U.S. Treasury Secretary George Cortelyou. Cortelyou immediately deposited $39 million into Morgan bank and gave JP Morgan discretion as to how it would be dispensed. When that proved inadequate, the Treasury stepped in with another $150 million, which dwarfed Morgan’s personal resources, and eventually staunched the bleeding. It was now clear that the private bankers could not run the bailouts. There must be a new federal facility to act as the “lender of last resort.” The Panic had scared the hell out of the bankers and the nation. It not only destabilized the monetary system; it set into motion a deep economic depression which engulfed the country. In the aftermath, there were two developments. One was passage of the Aldrich-Vreeland bill, a sneak preview of the Federal Reserve Act. It allowed government bonds and commercial paper to be used as collateral for emergency funds that could be issued by cooperative national banks of ten or more who met various criteria. The second was the authorization by Congress of a National Monetary Commission to study the entire financial system and report back. As will be discussed below, the Monetary Commission was the critical vehicle through which a decisive shift was engineered to impose, from the outside, the outlook and policy of European central banking onto the United States. European central banks were the creation of the European oligarchical families who used these so-called government allied banks to direct credit and money into their various schemes. At the turn of the century there were two models: the American System, which included the national banking system of Alexander Hamilton and his followers, culminating in the Lincoln administration National Banking Acts of 1863 and 1864, and the British System, typified by the Bank of England. The intention, however imperfect, of U.S. national banking, was to direct cheap credit into infrastructure and industrial projects for the purpose of increasing the physical standard of living of the entire population. European central banks– some run by governments, some more privately–were concerned only with providing money to the large banks and their allied imperial groupings for whatever financial schemes they were perpetrating. Some of the credit did go into useful ventures, but the purpose was to grease the skids of the large institutions. These central banks functioned as adjuncts to the 19th Century imperial system, typified by the pillaging of India, Africa, and Egypt, and scores of other victims. They served as “the house” in a global gambling operation, feeding the appetites of the big players. When financial bubbles popped, the central banks came in to clean up the mess, and issue more credit to finance new, equally destructive ventures. The transformation of United States’ banking policy for the 20th Century came directly out of the Monetary Commission. As one of its investigations, it sent a “fact-finding” mission to Europe in 1908 to meet with officials of the central banks of France, Germany, and Great Britain, and “be schooled” in their workings. Eighteen members of Congress went on the trip, accompanied by bankers Harry Davison and George Reynolds, and Harvard professor Piatt Andrew. Davison had recently been recruited by J.P. Morgan personally to join Morgan Bank. Reynolds headed Continental National Bank of Chicago and represented the emerging financial powers in the Midwest. He would later become president of the American Bankers Association. Davison acted as a spy for Morgan during the trip, and later become a partner at Morgan Bank. Commission member Piatt Andrew was an assistant professor of economics at Harvard. He took a two-year sabbatical in Europe to study the central banks of the aforementioned nations. He happily provided the reading materials for the commissioners on the trip to Europe, which would begin their indoctrination into the finer points of European central banking. After the trip, Andrew was heavily involved in the creation of the Federal Reserve. He would serve six terms in the U.S. Congress. The European mission was headed up by Nelson Aldrich, senator from Rhode Island. Aldrich steered the creation of an American central bank from 1906 to 1912. While he had little background in banking, he knew that the 1907 Panic had exposed the weakness of the current system. As a senior member of the Senate and the Republican Party, Aldrich took it upon himself to create an American central bank. Aldrich sought out the advice of many on Wall Street, and personally ran the European trip. His unofficial partner and host would be J.P. Morgan himself. When the commissioners docked at Plymouth, England, in August of 1908, they were welcomed to dinner at Morgan’s London home, with Lord Nathan Rothschild present. Morgan set up some of the ensuing meetings, and deployed his man Davison to conduct most of the interviews. The Morgan bank was at the center of the 19th and 20th century Anglo-American financial establishment, and had been involved in many of the most despicable operations of the British Empire. As Anton Chaitkin, Ron Chernow, and many others have documented, Morgan Bank was mixed up in the slave and opium trades, and up to their eyeballs in gun running, coups d’etat, and other nasty operations. (Anton Chaitkin, Treason in America, Executive Intelligence Review, 331 pp., 1998; Ronald Chernow, The House of Morgan, an American Banking Dynasty, Grove Press, 2010, 848 pp). The hard-core commissioners Aldrich, Davison, Andrew, and Reynolds held numerous meetings with the leaderships of the Bank of France, Bank of England, and the Reichsbank. The Bank of England had been established by private merchant financiers (gangsters and privateers) and acted as banker to the Crown, mainly to fund the ongoing wars. The merchants ran the colonies, and used the bank to fund the British military or their own private armies. The Bank later expanded its portfolio to include more “legitimate” operations: issuing notes, setting interest rates, protecting the value of the pound, and functioning as a lender of last resort. Lowenstein correctly documents that the BOE followed the diktat of Walter Bagehot, that the bank must be an open spigot. When conventional lending tightened in a panic, the Bank of England would “sail against the wind,” and provide the emergency credit to bail out the financial system (i.e., the big financiers). The Bank of France was based more on gold reserves and controlled by the state, while the Reichsbank was run by trained “experts,” including professional bankers. Even though the government technically held supreme power over the banking system, it rarely intervened. The meetings in Europe were extensive (58 in all), with assorted central bank officials, bankers, financiers, diplomats, and experts of all stripes. The Americans pressed their European hosts on the principal issues they were confronting: reserves—who held them, were they denominated in gold, cash, bonds, notes, etc. ; regulations– how credit would be dispensed; and elasticity, i.e. would the system be able to supply adequate currency to the banks, both in periods of calm as well as in panics? The U.S. system at the time tied the amount of currency in circulation to the Treasury bonds owned by the banks and held with the Treasury; it was inelastic, and did not allow the additional money needed to meet all circumstances. All money in circulation was based on the bonds held by the banks. There was no lender of last resort, a fact which had been thoroughly exposed in the Panic of 1907. Each central bank dealt with these questions differently. The common theme was that each was a private bank, which nevertheless held the national reserves (sic! ), notably the Bank of England, and their allegiance was to the financiers who ran them. Each bank informed the Americans that one of their main purposes was to provide a continuous flow of money into the system, based on discounting commercial paper (short-term corporate or other loans), bills of trade or other liquid assets, and dispensing cash in return. The European trip had a profound impact on the American delegation. By its end, they were total converts to financier-controlled central banking. Senator Aldrich was so transformed that he hunted down a portrait of Sir Robert Peel, the British prime minister responsible for the 1844 law that gave the Bank of England the exclusive right to issue notes. He sought to become the American equivalent of Peel! To further cement his conversion to central banking, Aldrich returned to Europe in the summer of 1909 with Piatt Andrew at his side. They held another round of meetings, and their biggest concentration was in Britain, where they met with the leadership of the country’s political establishment. The impact of the European trip, combined with the urgency of creating a vehicle to address future crises, set into motion a series of wide-ranging discussions, reports, and meetings. An American central bank must be created before the next crisis erupted. With the Republican Party still in power, the biggest impetus for change centered around Sen. Nelson Aldrich. In November 1910, he organized a retreat at the ultra-exclusive refuge on Jekyll Island, Georgia, to hammer out a plan. Aldrich gathered together a cabal of six participants who traveled in secrecy to the exclusive club. The group consisted of: Harry Davison, the Morgan banker who had gone to Europe with Aldrich; Paul Warburg, Kuhn Loeb partner and outspoken central bank advocate; Frank Vanderlip, president of National City Bank; Professor Piatt Andrew, who was a key player in the European tour, and now was assistant secretary of the Treasury; Arthur Shelton, Aldrich’s secretary; and Aldrich. What emerged from the week-long retreat was the outline of what would become the Federal Reserve Association. There would be many iterations, but the essential features were crafted in this meeting. The Aldrich Plan, as the final draft was named, called for the creation of a federal institution, but avoided calling it a central bank, to avert clashing with inbred American distrust of “big national banks.” Warburg wrote, “it was strictly a bankers’ bank.” The association would be composed of fifteen regional banks, who would also have the power to issue a new currency. They could also discount short-term loans, such as commercial paper, for equivalent amounts of new reserve notes. A Reserve Association in Washington, D.C. would control policy and oversee the various branches. Washington would set the interest rate for all the branches. The association could operate an open market for securities trading, but it would not be a deposit-taking bank. It would serve banks, not compete with them. The new institution would pay dividends to member banks, capped at 5%, with any surplus going to the Treasury. The Aldrich Plan was drafted into legislation, and a national campaign was launched by the Jekyll Island conspirators and their allies to gain passage in Congress. A great debate ensued to win over a skeptical public and even more skeptical regional bankers and businessmen. One obstacle which the book addresses was the deep-seated opposition to any kind of central bank by bankers and businessmen outside of the major metropolitan centers. In 1908 this represented the majority of economic forces in the country. They would have to be corralled, or snookered. To allay the fears of this grouping, it was decided that a significant amount of nominal power must be allocated to regional entities. Hence, the name Central Bank was dumped in favor of Federal Reserve, to mimic the federal structure of the government, which allocated some level of power to states and regions. They hoped this would counter the fear of the secretive power of Wall Street and its allies, which manifested itself in the prairie populism of the Midwest, and in the presidential campaigns of William Jennings Bryan. At the top of the central bank faction was Paul Warburg. Lowenstein calls Warburg “the hero of his story,” and it is indeed the case that the Kuhn Loeb banker was the major funnel of European central bank policy into the United States. Warburg hailed from the prominent German banking family of M.M. Warburg. The Hamburg-based bank had far flung global connections. Prior to Warburg being given a senior position, he was deployed on a seven-year mission to study financial activity, and also central banking in Europe and world-wide. He returned to take over the family bank, and married Nina Loeb, the daughter of the American Wall Street tycoon Solomon Loeb. Warburg and his brother moved to the United States and joined the prestigious Kuhn-Loeb banking house, ingratiating themselves into the upper echelon of New York power brokers. Paul began a close collaboration with Jacob Schiff, scion of the firm, and father of Freda Schiff, who in turn, married Paul’s brother Max in New York. From his perch at Kuhn Loeb, Warburg began agitating for a national bank in 1906, in collaboration with Jacob Schiff. In November 1907, Warburg penned a letter to the New York Times entitled “Mr. Warburg Urges Government Bank.” He argued that only a modern central bank, managed by private bankers, could halt the crises. He called for a central bank “governed by our best trained business men.” He followed this up with a monograph called “A Plan for a Modified Central Bank,” which was widely circulated in banking and commercial circles in New York and environs. Warburg kept up a drumbeat of speaking and publishing. In 1908, he testified at a hearing of the Monetary Commission held in New York, and later that year penned an essay on the discount system in Europe. He read a paper on central banking at the American Economic Association and joined the currency committee of the Merchants’ Association of New York. Much of his time was devoted to proselytizing for an American central bank. One of Warburg’s closest collaborators was J. Laurence Laughlin. Together they founded the National Citizens League, to recruit business leaders and civic activists to their cause. Although their ideas would eventually diverge, Laughlin was committed to bringing a central bank to the U.S. He would write the first drafts of the Federal Reserve Act. Laughlin also promoted the idea of an “asset-backed currency,” which would adjust itself automatically and immediately to imbalances in trade, output, etc. Bank loans would expand and contract “naturally” to meet demand from business and farmers. Later, this formulation would be embraced by Milton Friedman and Alan Greenspan, who promoted the insane idea that the Wall Street banks would self-regulate their derivatives trading. That did not turn out so well either. In 1911, Warburg and Laughlin joined forces in the founding and running of the National Citizens’ League, to promote the idea of a central bank. This became the major propaganda and recruitment vehicle to mobilize businessmen and bankers across the country to support the reserve system. They worked together despite the fact that Laughlin favored a decentralized bank and Warburg supported a very European central bank. Another chief conspirator in the drive for a central bank was H. Parker Willis. As a graduate student at the University of Chicago he studied under Laughlin and worked with him on the Indianapolis Monetary Conference, helping to write the final report. He went on to teach economics at Washington and Lee University, in the Shenandoah Valley in Virginia. Simultaneously, he covered banking for the New York Journal of Commerce, and emerged as an expert on the drive for reform. Willis was later hired by Congressman Carter Glass to be the legislative aide on the House Banking subcommittee chaired by Glass. Willis oversaw the subcommittee and worked in tandem with his mentor Laughlin to draft the Fed legislation. The chain of command worked as follows: Warburg controlled Laughlin, who in turn directed Willis, and they all conspired to shape the outlook of Glass. When legislation to create a central bank was written after the 1912 elections, it was Willis who literally grafted sections of the 1910 Aldrich Report onto the work product, tailored to a “Democratic” standpoint. The Democratic Party victory in the election of 1912 changed the prospects for attaining a central bank, but not the intention. The Democrats swept into power, and New Jersey Governor Woodrow Wilson became president. As Lowenstein documents, there was a shift from making the banking bill appeal to Republicans, who still controlled the Senate, to the incoming Wilson progressives. The aim was still to create a European-style central bank, which still could be deployed on behalf of the Wall Street and European banking elites to protect their interests and bail them out if things went horribly wrong. In Wilson, the Warburg-Hepburn-Reynolds banking group found a willing ally. A professed Anglophile, Wilson was a devotee of the Bank of England and European central banking. He admired the British parliamentary system, and sought to emulate it. He even proposed to change the U.S. Constitution to accomplish that. Wilson introduced British “party line voting” and “party discipline” to the Democrats in Congress. Coinciding with Wilson’s victory was the congressional inquiry into the financial shenanigans of the Wall Street robber barons, dubbed the Money Trust. Named after the chair of the Banking and Currency Committee, Arsene Pujo of Louisiana, the Pujo Hearings continued from 1912 into 1913. The hearings were run by a subcommittee of the House Banking Committee, with Wall Street antagonist Louis Untermeyer as lead counsel. They became a cause celêbre for months, exposing the behind-the-scenes manipulation of money and markets by the likes of Morgan, Warburg, Schiff, Baker, Stillman, Strong, Rockefeller, and their allies. The hearings revealed the “insider trading” operations of the Wall Street tycoons in securities and stocks, and created a sensation with the public. Massive interlocking directorates involving dozens of banks and corporations were brought to light; sweetheart deals between investment companies, banks, and corporations to pass around stock or securities to one another made headlines and shocked the public. While the Pujo subcommittee was running the exposé of Wall Street criminality, another subcommittee of the Banking Committee was tasked with “solving the problem” and reforming the financial system. This subcommittee was chaired by Representative Carter Glass. Carter Glass, who shepherded the bill through the House. In an all-too-typical display of Wall Street chutzpah, these financiers and their allies in the media used the public outcry of the Pujo hearings to create momentum for creation of the Federal Reserve, which those same corrupt bankers would control! Seizing the opportunity created by the hearings, in conjunction with the “reform” atmosphere swirling around the incoming Wilson administration, the Warburg-led cabal pivoted Democrat and moved to turn the momentum into new legislation. Wilson was more than a willing participant; he had stated that one of his main goals upon entering the White House would be “bank reform.” He immediately sought out the Glass subcommittee. Wilson, Warburg, and their allies were determined to use the moment to pass legislation creating a central bank. I will present the highlights of that operation, first on the House side, with the Glass Bill, and then on the Senate side, with the Owen bill. December 1912: Willis and Laughlin issue a preliminary draft of the proposed act, and Wilson added the idea of a “capstone” grouping in Washington to oversee the reserve association (which became the Federal Reserve Board). Glass espouses the populist anti-Washington outlook. He wants a large number of local branches to exercise significant control over the new system. To appease the Bryan-populist wing of the Democratic Party, Wilson claims his position is “anti-big bank;” but he was the leading proponent for a national leadership/capstone group. He was followed by Warburg who said the Aldrich Plan was one way, but not the only way to solve the reserve bank problem. “….you will find that you will come toward a centralized reserve system in some form.” Warburg had just written and submitted a plan for a central bank reserve system to confidential Wilson advisor Henry Morgenthau in which he outlined plans for a central bank on the European model. Warburg was followed by, among others, George Reynolds, head of Continental National Bank of Chicago, a leader of the American Bankers Association (ABA) currency committee, and a member of the Aldrich Monetary Commission trip to Europe in 1908. Reynolds calls for the creation of a central controlling board with branches around the country. March-April 1913: The ABA met behind closed doors with Glass and Willis as work proceeded on the Glass Bill. Col. Edward House, senior Wilson confidante, and arch Anglophile operative, was deployed to monitor the progress on the Reserve Association bill. After the legislative committee of the ABA met with Glass, a draft was prepared. Col. House passes the outline secretly to Warburg, who in turn circulated it among key allies for comment and changes. Warburg submitted a number of proposals, most of which were adopted in the draft. Among the main points that Warburg called for were: reducing the number of reserve banks so that reserves could be pooled, a central deman of his; a ceiling on dividends that the reserve banks would pay their bank members; and a reduction in reserve requirements, to allow greater “investments, ”read speculation, and other shady operations. All were adopted. September-October 1913: While the Glass bill does not contain all that Warburg, Hepburn, et al want, they push for immediate adoption by the House. Bryan and his allies call for a government bank, and failure to pass the Glass bill might afford them the opportunity. A government-run facility, where the government would issue money, rather than the private banks, would usurp power from Wall Street. Given the threat, the ABA, Warburg, and their allies push for immediate passage of the Glass bill. They are joined by President Wilson, who goes before Congress to demand support. Wilson invokes party line voting to force the issue. Warburg, still calling for more centralization, nevertheless comes out in support of the Glass Bill. September 18: The Glass bill passes the House and goes to the Senate. Many pro-central bank advocates emerge from the background to campaign for the measure. On October 27, Jacob Schiff, a big financial backer of Wilson, calls for speedy passage of the Glass legislation. Henry Davison, Morgan banker and a participant in the Jekyll Island meeting, who was a supporter of the Republican Aldrich Bill, switches sides, and campaigns for the Glass legislation. Supporters of a central bank realize that this is their moment. They are told by Glass and others that they should act now, or face the possibility that the Bryan Democrats would draft their own legislation and marginalize the role of Wall Street bankers entirely. The Senate bill was drafted by Robert Owen of Oklahoma, also a Jeffersonian Democrat, but more progressive than Glass. Ironically, Owen was born in Lynchburg, Virginia, within shouting distance of Glass. He moved to Oklahoma, went into business, became a banker and a student of bank policy. In 1898 he made the pilgrimage to Europe to study central banking. Senator Robert L. Owen, who shepherded the bill through the Senate. Owen’s trip predated that of Nelson Aldrich and company by 10 years, with the same predictable result. A convert to central banking, he opened himself to manipulation by the proponents of the reserve system. When it was clear there would be a Senate companion bill to the Glass legislation, the “usual suspects” flocked to Oklahoma to “educate” the Senator. Two of Owens’ closest advisors became Hepburn and Warburg, with whom he would constantly correspond. Piatt Andrew, a member of the National Monetary Commission who shaped the discussions on the junket to Europe, wrote Owen’s bill. November 1913: Warburg focusses his public energies on making the renamed Glass-Owen bill more centralized, by proposing the elimination of more reserve branches. Warburg wants a tightly controlled system of no more than eight branches, not the fifteen that were being debated. On November 10, Warburg rides the train from Washington, D.C. to New York with Sen. Owen. Warburg convinces him to drop many of the Bryanite “prairie suspicions” of a central bank which he harbored. Following the trip, Warburg and Owen stay in regular touch, and Warburg is brought in to mediate between the warring factions on the Senate Banking Committee. Most importantly, Warburg became a conduit for correspondence from European bankers to Owen and other Senators. European bank officials send numerous letters and communiques through Warburg into the Senate urging passage of a European-styled central bank. Input from Warburg results in Owen lowering the number of reserve districts to eight and loosening the requirements on bank discounting. December 1913: Intense lobbying by the Warburg banking group in the Senate against the influence of Bryan. Wilson personally intervenes to demand strict party line voting, to prevent defections from vacillators. The bill passes the Senate on December 19. It is sent immediately to conference committee to reconcile the Senate with the House version; they were not identical. There were many divergences, the most interesting being that the Senate bill contained a section advocating deposit insurance for the banks, a precursor of Glass-Steagall. That was dropped from the final version. December 20-23, 1913: Conferees work speedily to resolve the differences. They cut the number of reserve cities to between eight and twelve (The House version wanted fifteen), under intense lobbying from Warburg and allies. They cut bank reserve requirements from the National Banking Act to 12% for country banks, 15% for middle-tier banks, and 18% for central reserve city banks. Under the prior regime of the National Bank Acts, the reserve requirements were 15%, 25%, and 25% respectively. Today they are far less. This allowed more lending, i.e., greater elasticity in the system. The entire bill, Glass-Owen, the Federal Reserve Act, passes on December 23. Passage of the Federal Reserve Act of 1913 was part of a larger package which included ending protective tariffs, which dated back to Alexander Hamilton and his successors, and the passage of an income tax. All of this was rammed through by Wilson during 1913. As stated previously, the American System policies of Hamilton and allies were designed to develop industry and infrastructure in the nation. Under the “Free Trade” system of Wilson and his cohorts, the nation became a collaborator of those same European imperial policies against which we fought the American Revolution. The imperialists of Europe could not militarily defeat the United States, so they moved to destroy us from within, and turn us into an ally. On October 3, Wilson signed the Revenue Act of 1913 which sharply reduced tariff rates from the Aldrich tariff of 1909. In the same bill, an income tax was created, which applied a tax of 1% on incomes above $4,000 and steeper rates as incomes rose. The purpose of the tax was to help finance WWI, as was the passage of the Federal Reserve Act itself. Thus, a very unpopular war, World War I, became the avenue through which the entire Hamiltonian system was overthrown. The transformation of the United States banking from the Panic of 1893 onward, into a replica of European central banking was complete with the passage of the Federal Reserve Act in 1913. The European intervention was decisive; it was a de facto coup by a foreign entity against our financial system and our nation. There were many drastic changes embedded in the new law. The previous system of segregated bank reserves was replaced by a centrally directed group of Reserve Banks, which would dispense funds and credit. The Federal Reserve became the long-sought-after “lender of last resort” to bail out the banks when all else failed. The Wall Street wheelers and dealers could now marshall the reserves of the entire nation for their benefit. They could gamble “with other people’s money”, as future Supreme Court Justice Louis Brandeis wrote, and get bailed out if “their genius failed,” as Lowenstein said of the collapse of 1998 Long Term Capital Management. The currency would now be issued by the Federal Reserve system, not the Treasury, and was more elastic. It could expand and contract as needed. The imposition of a Wilsonian capstone, namely the Washington, D.C. Federal Reserve Board, moved the nominal seat of power to Washington. The real power was moved to New York. The legislation established a lender of last resort, sorely missing over the past decades. It also allowed the Wall Street banks to set up affiliates in Europe and elsewhere, something banned by the Lincoln system. It expanded their speculative reach, and allowed them to swim in even more deregulated waters. As the Federal Reserve System got going, clear lines of power emerged. First, Paul Warburg was appointed to the Federal Reserve Board in Washington, D.C., at the urging of Col. House. Thus, the Washington, D.C. board had the requisite Wall Street and European central bankers’ line of communication and influence. Second, the New York Fed quickly emerged as the most powerful of the Reserve Banks of the twelve district banks which were created. It had the most capital, with over four times that of the Atlanta branch. The chair of the New York Fed was Benjamin Strong, an ally of Warburg, and an attendee at the Jekyll Island retreat. The rise of the New York branch of the Federal Reserve also coincided with the renewed power of the Money Trust, which had never been dismantled. With the approval of the Federal Reserve Board in Washington, the New York Fed took control over all foreign operations for the entire Federal Reserve System. Foreign trade for the nation was financed through the New York money market. The New York Fed was appointed banker for the United States’ government in its financial transactions with foreign nations. Starting in 1915, the New York Fed became the official agent of all the Federal Reserve district banks in the purchase of securities and acceptances. From 1922 onward, it handled open market operations for the entire system. Also, it was directly involved in New York Stock Exchange operations because most of the call money sent to the Exchange involved the New York branch. Most important, the New York Fed set the discount rate which became the rate for the whole system. Reserves began to flow into New York, and the Wall Street banks regained their lost dominance. Passage of the Federal Reserve Act could not have been more propitious, wittingly or otherwise. The Great War was raging in Europe and the allied imperial powers, headed by Great Britain, were desperate for U.S. entry into that horrific conflict. The United States finally joined the war in 1917, and the role of the Fed in helping to finance the United States and the allies underscored the transformation of U.S. banking. The United States also crossed a threshold of joining with some of the very nations who were our sworn enemies for over one hundred years, notably the British Empire. Alexander Hamilton explicitly prohibited the Bank of the United States from buying government securities or helping finance military conflicts. The Bank of England was created precisely to finance wars of the British Empire. Hamilton was determined not to let the Bank of the United States fall into that trap. When the U.S. entered World War I, the Treasury Department leaned on the Fed to keep interest rates low, which it did. The Federal Reserve banks then purchased bank credits backed by Treasury notes and bonds, totally violating Hamilton’s warnings. As Lowenstein documents, Federal Reserve Bank assets became concentrated in government securities, not the commercial paper that was written into the Act. The United States came to the aid of Britain and France in the war, and exported food, arms, and supplies to their allies. The United States became a significant creditor nation and no longer a debtor. Under Warburg’s guidance, the Congress amended the Federal Reserve rules to allow it to increase its note-issuing capability. Federal Reserve notes in circulation doubled overnight, and the Reserve Banks soaked up gold bullion which had been used to pay for supplies by the Europeans. This newly acquired stash of gold in the coffers of the Fed increased the value of the dollar and the status of the U.S. currency in the eyes of the world. The Federal Reserve had become a central bank on a par with its European sponsors. Its rotten role would complement the Wilsonian takeover of U.S. domestic and foreign policy, and help turn the nation into a useful tool of the same aristocrats against whom we founded the nation. That downward slide would be temporarily halted with the ascent of Franklin Roosevelt, and later John F. Kennedy, to the Presidency. That is another story, but the die had been cast. The Federal Reserve would never become a National Bank in the tradition of Alexander Hamilton. Its dual mandate, of stable prices and maximum employment, under a regime of moderate interest rates, was in reality a single mandate. That mandate is to ensure the financial well-being of the large Wall Street banks. As the original debate demonstrated, the Federal Reserve is a bankers’ bank, period. That is why the Federal Reserve has steadfastly refused to use its immense resources and power to intervene on the side of Main Street. Despite constant pleas from members of Congress and others that the Fed address the jobs and income inequality disaster, the Fed has remained tone deaf. But when its policies contributed directly to the 2008 financial meltdown, it had no problem ponying up $16 trillion in near zero percent loans and loan guarantees to the same Wall Street banks who precipitated that catastrophe. Then again, those banks, all centered in lower Manhattan, control the Federal Reserve, which they created for just such crises. Gabriel Kolko, The Triumph of Conservatism, Free Press, 1977, p. 141. Kolko, op. cit., p. 142. Nomi Prins, All the President’s Bankers, Nation Books, 2014, pp. 2-4. Lowenstein, op. cit., p. 114. Lowenstein, op. cit., p. 71. Lowenstein, op. cit., p. 73. Kolko, op. cit., pp. 228-9. Louis Brandeis, Other People’s Money, Create Space Pub, 1914, republished in 2009. Roger Lowenstein, When Genius Failed, Random House. 2001. Lowenstein, America’s Bank, p. 253. Kolko, op. cit., p. 256. 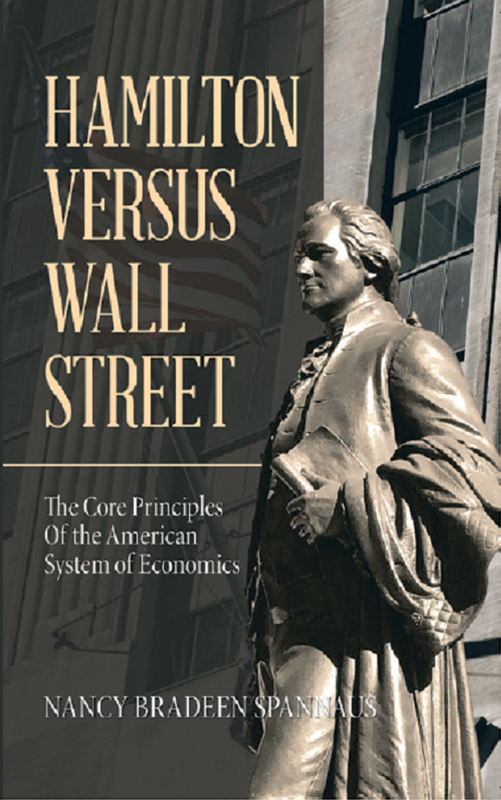 Nancy Spannaus, Hamilton Versus Wall Street: The Core Principles of the American System of Economics, iUniverse, 2019. Bernie Sanders, The Fed Audit, July 2011.